PacoGames is something like YouTube for games. Users can play there, publish own games, discuss, share feedback or even read, watch or create games related content. This article provides a process of publishing own games on PacoGames. By registration to GameArter, a developer gets automatically public developer account. Its full version will be available on GameArter domain and will be useable for full presentation of the developer and his work. Basic informations and actions related to GameArter developer account are accessible via public API and webmasters can load and use these data for creating local web-based view of these accounts. Visit of full GameArter developer account will be always possible by pressing a button with text "Display full profile on GameArter". Image above displays an example of developer account on PacoGames.com. This account contains developer's name, profile photo, games and social sites. These data can be set and adjusted in profile section on GameArter (see point 2). The profile also reflects number of players following the developer and an option to become a follower as well. Filling account information is very important. Firstly there is need to set informations for the developer profile (see point 1) and secondly make some default choices - e.g. whether you want to receive feedback from users or not. Feedback is being sent directly to developer's email. Users can send it over feedback section / report bugs form. As a tool above which games are built (SDK integration). 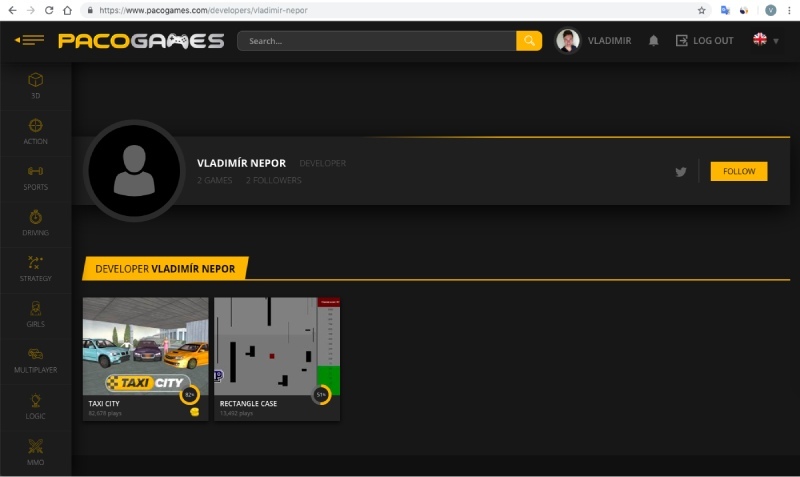 GameArter's software development kits allow simple and fast implementation of complex features (user accounts, achievements, leaderboards, secure data management, in-game purchases, tournaments, assets management, analytics, ads and many more...) in short time without need of high knowledge of programming. It is worth to mention also fully customizable gameplayer, tools for users interaction, powerful hosting, game distribution service or e.g. analytics solution. Check more in separated articles GameArter as a tool for games management - Game Development phase & Post-release phase. As a tool collecting all developers games without matter of where they are hosted or what service they use. Once the game info and link at this game is added to GameArter, there is possible to take a claim for adding the games on websites in GameArter ecosystem (PacoGames.com, Games44.com). Note that webmasters of websites has full right to select what games they will list. Image above also contain a button for reporting issues (first button from the left side). By pressing this button, there is opened new modal window for reporting bugs and providing any other feedback. This report is either sent directly to developer's email account (if enabled) or to GameArter team which serve also as a support for players. If a developer decides to write or reply to any comment, he has automatically label "DEVELOPER" beside his name. Name linking to his developer account. In discussions below games of other developers, this "developer" stands out like any other common user. This user account was created together with developer account during registration to GameArter. Email address is same, however profile photo, name and other informations can be different - adjusted in profile section on PacoGames. Games inserted via iframe, running from 3rd party services: no revenue share on PacoGames. Monetisation of these games is possible via own in-game ads. Games powered by GameArter: Share 70% of all displayed in-game ads powered served GameArter + revenue of affiliate traffic. Games powered by GameArter, focusing on user experience. PacoGames provides extra bonus for quality games focused for best user experience. 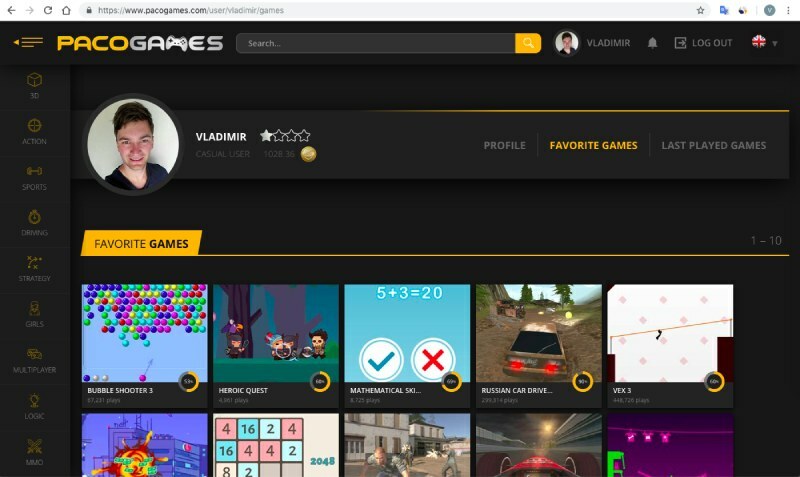 The main emphasis is put on using GameArter's data storage service and implementation of suitable features improving gameplay (achievements, leaderboards, connection with shared gaming currency GRT) and other features provided by GameArter. Bonuses are build on basis of algorithm working with user engagement and does not reflect income of ads. Generally, quality games are getting more revenue from this system than they would get from counting on basis of ads. 20% of best games gets 100% share of this revenue, next 20% gets 80% and the remaining 60% gets 60% of the revenue. Since January 2019, these games will be usually also connected with in-game purchases which means other additional revenue. 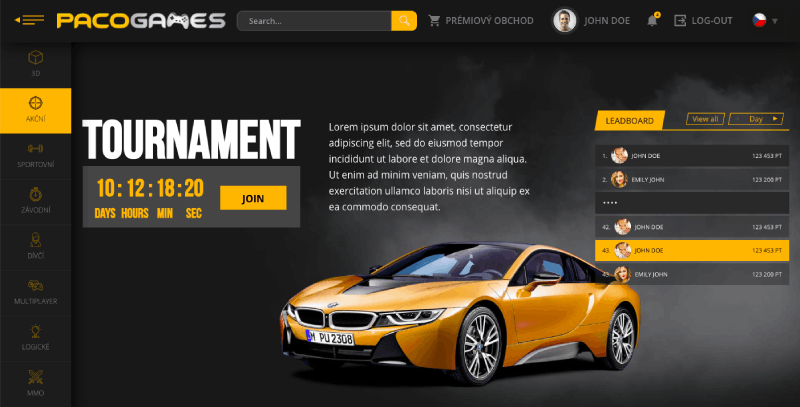 Games placed on PacoGames are automatically promoted via PPC campaign and social sites. There is an option to include games out of this algorithm and buy an extra place for them on PacoGames. Games powered by GameArter SDK has 50% discount of the price. PacoGames is open to cooperate with vendors on marketing purposes and operation of their quality games on web. PacoGames uses extra GameArter's services available over GameARter's API for additional promotion of quality games on PacoGames. Example of such promotion is a tournament created in certain game. Tournaments support is natively implemented in GameArter's SDK and does not require any game preparation or developer's work. Create quality games. Games have to look well and be optimized for smooth running and low filesize. All UI elements must be clear and do as is usual. Any tecniques redirecting players without their request are strictly prohibited. Do not use excessive number of ads. Keep minimum time between ads 3 minutes or higher. For the best performance there is recommended to implement GameArter's SDK. As a reward for this extra work a developer gets 70% of revenue share generated by GameArter. The advantage of GameArter SDK is bringing the best possible user experience from playing (auto login, server data storage, rewards from playing, social layer...) which is usually reflected in users behaviour and thus it positively affects game promotion algorithm on PacoGames and other websites. Do not do games with excessive violence and brutality. Simple to use discussion solution shared for game and websites - all comments are in one place. Developer's contributions have verified label "developer". Are you interested in developers who publish games on PacoGames? Then check list of game developers. Publishing web versions of games on PacoGames and other websites via GameArter is great way to promote your Google Play, App Store, Steam and other more robust versions of your games. Games promotion via classic channels is very expensive, often unprofitable. GameArter offers such promotion for free and even earn developers money during such promotion via in-game revenue channels. If you are interested in more ways to promote your games on your own, check our post How to promote small games. Did you find your game attached to foreign developer account? Report it via our contact form.